I’d been wondering why the fox mostly comes at night these days, when I realized that it may be due to a new hunter that’s moved in. 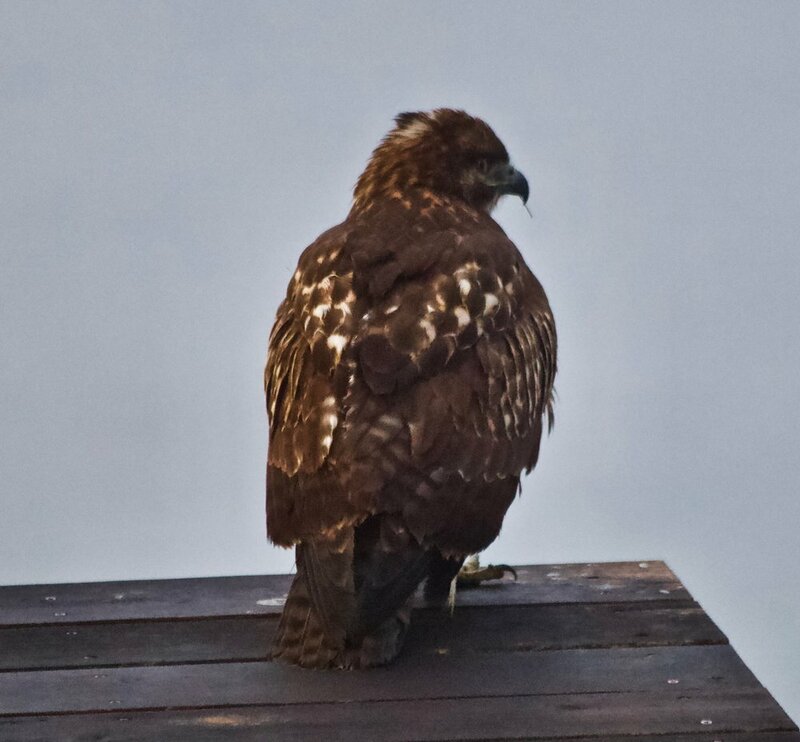 It seems the Cooper’s hawk that was perching on the rooftop corner these past few weeks has been supplanted by a mystery guest – the gorgeous creature pictured here. S/he likes to perch at the same corner, and also on the edge of the deck and the railing in front of my writing studio (extra thrilling for me, anyway). S/he’s also ‘staked out’ in the field where the new hedgerow has just been planted, hunting from one of the new metal stakes supporting the temporary deer fence. The fence posts and cypress trees are proving very popular: there are now also kestrels and some sort of small, gray falcon. The question is, Who are these fellas? Are they dark morphs of red tails (their call sounds hawkish: squee, squee) but they’re absolutely huge with no red on their tails whatsoever. They resemble the golden eagles I’ve seen – can anyone out there help me identify these beauties? In the meantime, they’re feasting on gophers and mice and I am grateful. There are also big white splotches of big-bird-poop on the driveway bey the ‘gate’ (actually a dilapidated and very porous bunch of metal supports, rusted wire and bungee cords). I can grab my trusty binoculars and birdwatch anytime. What a luxury! Plant it and they will come. This is a precious teaching, and just in time. The mess unfolding in the big ‘out there’ has been getting to me. But look: how little it takes for Life to respond and to regenerate in profusion. Even the whales are back, on their way to the warm waters off Baja. The other day, great misty plumes appeared between the fog bank and the shore. Welcome, and Thank You.